In order to keep your RHEL 7 systems secure, you need to know how to monitor all of the activities that take place on such systems by examining log files. Thus, you will be able to detect any unusual or potentially malicious activity and perform system troubleshooting or take another appropriate action. In RHEL 7, the rsyslogd daemon is responsible for system logging and reads its configuration from/etc/rsyslog.conf (this file specifies the default location for all system logs) and from files inside /etc/rsyslog.d, if any. A quick inspection of the rsyslog.conf will be helpful to start. This file is divided into 3 main sections: Modules(since rsyslog follows a modular design), Global directives (used to set global properties of the rsyslogd daemon), and Rules. As you will probably guess, this last section indicates what gets logged or shown (also known as the selector) and where, and will be our focus throughout this article. Though not a priority itself, the keyword none means no priority at all of the given facility. Note: That a given priority indicates that all messages of such priority and above should be logged. Thus, the line in the example above instructs the rsyslogd daemon to log all messages of priority info or higher (regardless of the facility) except those belonging to mail, authpriv, and cron services (no messages coming from this facilities will be taken into account) to /var/log/messages. In other words, the facilities mail, authpriv, and cron are grouped and the keyword none is applied to the three of them. As a self-study exercise, I would recommend you play around with the facilities and priorities and either log additional messages to existing log files or create new ones as in the previous example. To prevent log files from growing endlessly, the logrotate utility is used to rotate, compress, remove, and alternatively mail logs, thus easing the administration of systems that generate large numbers of log files. Logrotate runs daily as a cron job (/etc/cron.daily/logrotate) and reads its configuration from/etc/logrotate.conf and from files located in /etc/logrotate.d, if any. As with the case of rsyslog, even when you can include settings for specific services in the main file, creating separate configuration files for each one will help organize your settings better. 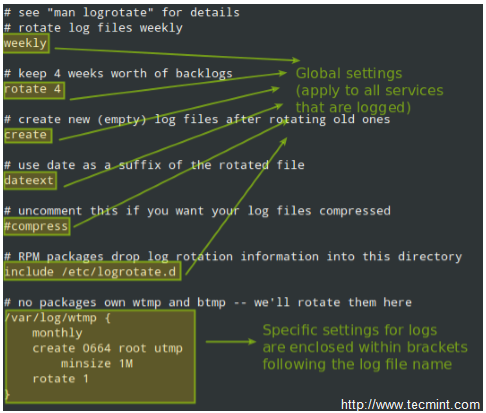 You can read more about the settings for logrotate in its man pages (man logrotate and man logrotate.conf). Both files are provided along with this article in PDF format for your reading convenience. As a system engineer, it will be pretty much up to you to decide for how long logs will be stored and in what format, depending on whether you have /var in a separate partition / logical volume. Otherwise, you really want to consider removing old logs to save storage space. On the other hand, you may be forced to keep several logs for future security auditing according to your company’s or client’s internal policies. Of course examining logs (even with the help of tools such as grep and regular expressions) can become a rather tedious task. 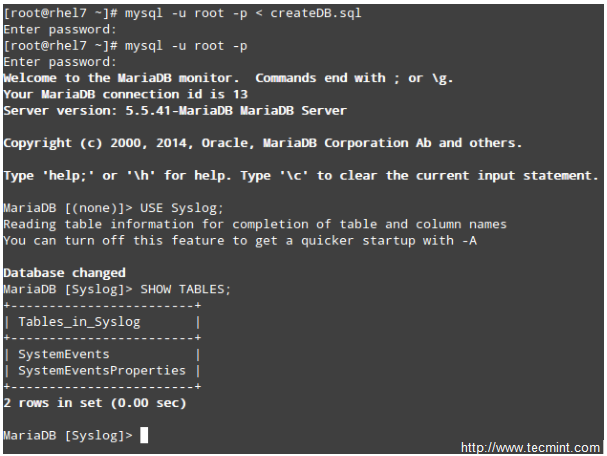 For that reason, rsyslog allows us to export them into a database (OTB supported RDBMS include MySQL, MariaDB, PostgreSQL, and Oracle. 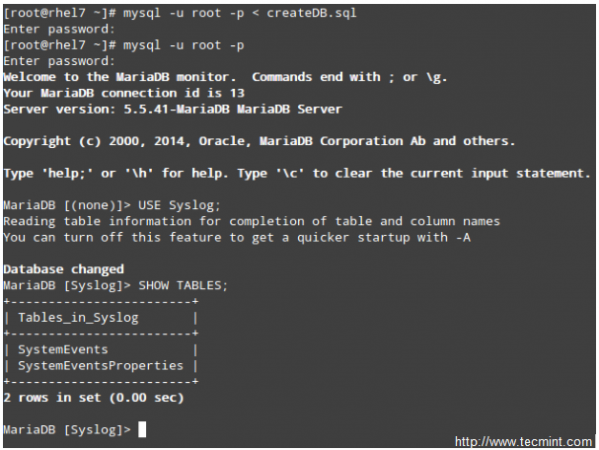 Note: If you don’t want to use the MariaDB root user to insert log messages to the database, you can configure another user account to do so. Explaining how to do that is out of the scope of this tutorial but is explained in detail in MariaDB knowledge base. In this tutorial we will use the root account for simplicity. In this article we have explained how to set up system logging, how to rotate logs, and how to redirect the messages to a database for easier search.